Graphics One has a new QuickLook Book! 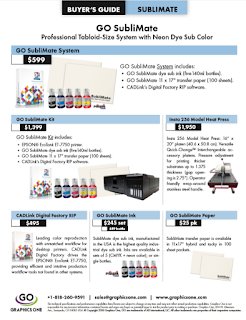 Take a peek at some of our exciting new products like the GO xPress Manual 3040 Heat Press for apparel applications. The QLB is conveniently divided into ten sections including: Printers, Accessories, Color, Cutters, Displays, Finishings, Inks, Media, Software and Tek Parts.